Who doesn’t love a good smoothie? I know we do. 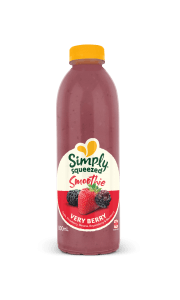 Simply Squeezed offer a huge range of healthy smoothies in supermarkets across New Zealand. We offer a great selection of fruit smoothies and spirulina smoothies a perfect fruity snack on the go. Find your favourite flavour below and look for us in store today. It takes just the right touch to create the perfect Feijoa smoothie. In the Sunny Hawke’s Bay, we’ve created a smooth and delicious Feijoa smoothie, perfect for getting more out of your day. What’s lean, green and full of goodness? 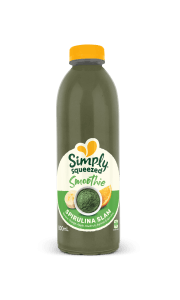 It’s the spirulina in this tasty smoothie. It’s blended down in the sunny Hawkes’ Bay to give back what your busy day takes away. So take five and get more out of life. You can’t beat a ripe and delicious strawberry. 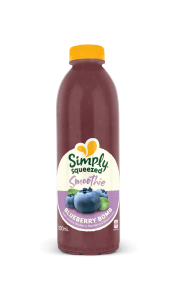 You can, however, blend all that berry goodness into a very refreshing smoothie. And in sunny Hawke’s Bay, that’s what we did. Here it is now to help you squeeze more out of life. Behold the super blueberry. Rich in all kinds of goodness, it tastes as good as it looks, especially after it’s been blended into a delicious smoothie in the sunny Hawkes’ Bay. It’s a great way to get more out of life. Fancy a refreshing break? Try this delectable tropical smoothie. Let the blast of mango, pineapple and passionfruit spirit your tastebuds away to a smoothie paradise. Goodness blended in the sunny Hawkes’ Bay to help you get more out of today.